Watch: Katrina Kaif And Aditya Roy Kapoor Reveal Many Secrets At Fitoor Promotions! [tps_footer]Bollywood actress Katrina Kaif is currently promoting her most awaited upcoming film Fitoor with co-star Aditya Roy Kapur. With back-to-back promotional weeks, Katrina and Aditya were spotted at another event yesterday on February 10. Dressed in color block popover ‘Jill Jill Stuart’ outfit, with gold earrings and open hairdo, Katrina Kaif looked pretty like always. 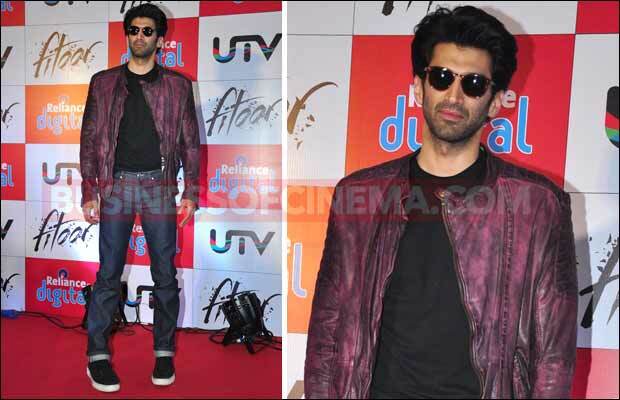 While her co-star Aditya Roy Kapur looked dashing in casuals paired with leather jacket. The two stars were seen having a gala time while interacting with media at the event. From making a grand entry to mesmerizing the audiences with her beauty, Katrina Kaif was the spotlight at the event. Well, with back-to-back promotions, now the film is nearing for its release on February 12. The duo were seen revealing many secrets at the event. Watch the below videos to know the exciting questions and answers. The two stars who are sharing the screen space for the first time with their sizzling chemistry, are looking forward for their big release this week. Both Katrina and Aditya have left no stone unturned for the promotions of their film, now we wait to catch what magic the film creates at the Box Office. Katrina Kaif Speaks Up On Finding Love Again After Ranbir Kapoor! Katrina Kaif Reveals Valentine’s Day Plan! Katrina Kaif Reveals What She Can’t Live Without! Who Is Katrina Kaif’s Lucky Charm? Previous articleShraddha Kapoor Is All Geared Up To Croon For Baaghi! Next articleWatch: Aishwarya Rai Bachchan Gets Angry With Media For Hurting Daughter Aaradhya!